Should my Business add a Mascot Into its Marketing Strategy? How to Market Your Brand - Is Your Mascot Your Secret Sauce? These Mascots Love the Cold Weather! Our Mascots Perform Around the World! Building a Sense of Community with Choo Choo Charlie, The Grand Station Mascot! How to Take a Great Mascot Photo! Football Fun with Stripes, the Hamilton Tiger-Cats CFL Mascot! Thinking of Getting a Mascot? Here’s Why You Should. How Do You Know When Your Mascot Costume Needs Some TLC? BAM Mascots Creates Custom-made Puppets! 5 Tips to Improve Your Mascot 'Cheerleading'! You Can Learn From This Brand Monkey! What is Mascot Concept Art? Animate Your Logo with a Custom Mascot! Is Your Mascot a Community Celebrity like Burli the Bayhawk? 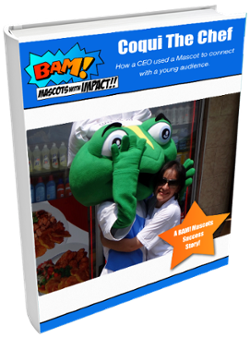 How to Increase Your Mascot's Lifespan! Is Your Mascot A Monster? Our new BAM Mascots website launches!